Not long after Ten unexpectedly topped the charts, Pearl Jam became notorious for their intense live performances. Even more notable than the group's unbridled energy was their willingness to stretch out their songs or throw in covers, reminding jaded audiences that rock concerts could be electric and energetic. Their Seattle peers were equally (sometimes more) compelling, but Pearl Jam skillfully made arena rock feel as intimate as a punk club show -- something that no other band of their time could do. Instead of building this reputation throughout the course of the '90s, the quintet let it fade away as they became embroiled in a vicious battle with Ticketmaster that ultimately proved unfruitful. Not only did the court cases tie up several years of touring, they also refused to play any venue with contracts with Ticketmaster once it was finished -- which meant they played off-market venues that were difficult to reach, thereby decreasing their potential audience substantially. Once 1998's Yield didn't move as much as anyone expected, the band released Live on Two Legs a few short months later. It was culled from Yield's supporting tour, and the difference is substantial -- Pearl Jam still sounds good, but they lack the wild energy that distinguished their early years. Professionalism has its good points, however, and it's true that Live on Two Legs is eminently listenable, thanks in no small part to a fine track selection illustrating that the best moments of No Code and Yield rank with Ten, Vs., and Vitalogy. 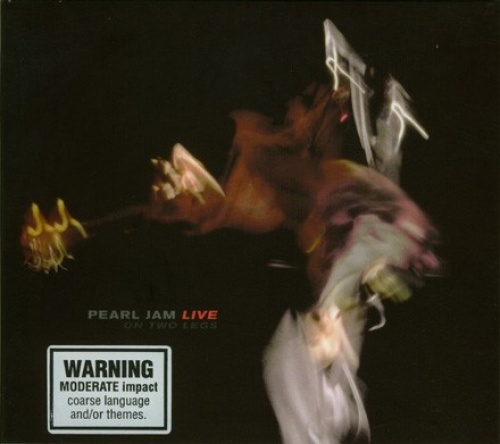 For all the good points -- the tight interaction, the occasional nifty solo, Eddie Vedder's powerful performance -- the album never quite catches fire. Instead, Live on Two Legs is a souvenir, a thank you to fans who have stood by throughout the years, and on those terms, it's successful.